Best time for Rwanda Safari: The best wildlife viewing months in Rwanda are during the Dry seasons from June to August and December to February. Primate walks in the forest are a big part of any safari in Rwanda. The habitat of rainforests is, by default, very wet, and one can’t avoid rain completely. Bordered by well-known Tanzania and Uganda, Rwanda is a small country in East Africa with big tourism potential and a lot of Rwanda attractions to offer budget and luxury travelers alike. With Rwanda attractions opportunities to see wildlife and culture as well as hike and relax, we avail you a number of Rwanda tours options to make Rwanda your travel choice so easily. There are other Rwanda attractions, and efforts are underway to return them to their former glory. Tucked away in the north east of the country, and opened in 1934, Akagera National Park has been quietly rebuilding its stock of large plains game species. Lions were reintroduced last year and there are plans to reintroduce black rhino too, restoring the park’s ‘Big 5’ status. If monkeys are more your thing, head south to the dense forests of Nyungwe National Park. Covering over 1,000 square kilometres of pristine mountain rainforest, the park is home to 25% of all primates in Africa, including chimpanzees, and East Africa’s only canopy walkway. From some of the world’s most wonderful wildlife to a particularly progressive capital, Rwanda is a diverse and different destination that ought to be on your bucket list. Here are some Rwanda Tours choices for your Rwanda Safari Planning. In Rwanda’s rich rainforest landscape live some of the most endangered, but incredible animals on this planet. 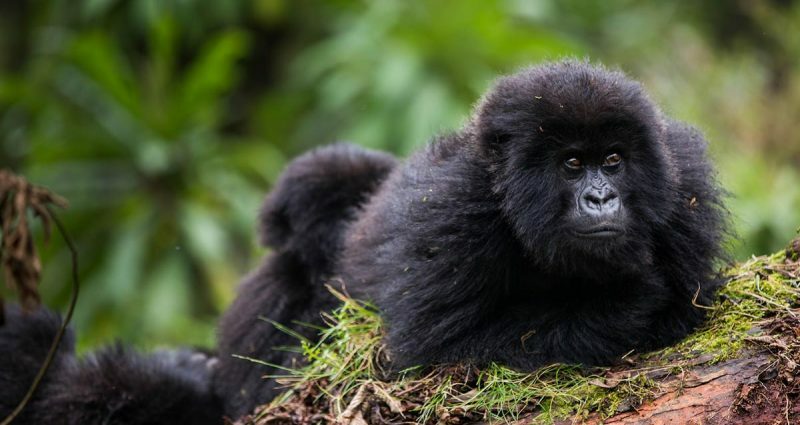 Trekking to see the gorillas – while really expensive – is one of those lifetime opportunities you can’t afford not to do when in this part of the world and it’s definitely one of the most famous things to do in Rwanda. Speaking of primates, you can also view chimpanzees in the wild in Rwanda and one of the best places to do so is Nyungwe Forest. With canopy walks and waterfall hikes, the scenery here is breathtaking and the many bird and butterfly species, as well as golden monkey populations, definitely make it one of the top things to do in Rwanda. There are actually 13 hikes in this park – that’s over 130km of trails – most of which traverse ancient and stunning rainforest. Rwanda’s top national park, Akagera is a safari paradise and is the last protected wetland in Central Africa. It’s the only place in Rwanda where you can see the Big 5 and these are accompanied by giraffes, zebra as well as antelope, baboons and hundreds of species of birds. So don’t feel like you have to go to Kenya, Tanzania or Uganda for your safari experience, heading to Akagera is definitely one of the best things to do in Rwanda. Rwanda’s recent history can be hard to stomach, but the Genocide Memorial Centre in the capital Kigali does a fantastic job of educating us about it and providing an important space of remembrance and peace. Taking the audio guide through the exhibition and displays is highly recommended and well worth paying the extra for, giving you an in-depth understanding of the horrors that took place here in 1994 as it does. The centre also acts as a burial ground and a vital space for the nation’s bereaved. Opened in 1999, it’s been incredibly well put together with some beautiful garden spaces surrounding it. It seems strange to be linking one of the worst genocides in human history with some the best things to do in Rwanda, but if you’ve seen the movie, Hotel Rwanda, you’ll know what I mean. This incredible film depicts the amazingly brave and true story of the hotel manger here, who managed to keep 1268 people safe inside the building during the killing sprees in 1994. If truth be told, the actual Hotel Rwanda – really called the Hôtel des Mille Collines – was not used in the film, but the real building still exists today in Kigali.A prestigious place, it’s still worth going here in homage to the selfless acts conducted here and to enjoy the view from the terrace. Kibuye juts its way into the blue-brown waters of Lake Kivu in a series of curved headlands and steep-sided bays. Surely one of the most handsome towns in all of Rwanda, it’s surrounded by high hills that come dressed in wisps of mist by morning and offering sweeping views of the lake waters and the islands by afternoon. Between the streets, there are some earthy little eco lodges on the shores, along with one interesting Catholic church, and a memorial to the Rwandan genocide. There’s also a smattering of empty beaches around the center, and oodles of boats available for tours away from the banks. Kigali is considered one of the friendliest capital cities in Africa, and its metropolitan ambience is a great complement to your time in the Rwandan bush country. The population of the city is young, so you will find a diverse range of engaging activities blended with a bit of history and culture. As Rwanda continues to emerge from a tragic past, Kigali represents the future; it has become a thriving center for business and economic development, while maintaining its charming character. Development has been well planned to preserve the natural contours of the surrounding hillsides. The city is divided into distinct districts, with one reserved for government and administrative buildings. In another district, the city center is surrounded by shops and markets. In Kigali, a new treasure awaits around each corner as you travel the roads that wind through the city. You can learn about the country’s flora and fauna at the Kandt House (Natural History Museum), which features three sections, each highlighting an aspect of Rwanda’s ecological resources. Geology lovers immensely enjoy the displays in the back section of the museum, dedicated entirely to the country’s volcanism and the astonishing volcanoes in northwest Rwanda. Discover the country’s evolving artists at Inema Art Center. Stop by Ivuka Arts Center to watch artists make their creations before enjoying a nice lunch at Heaven Restaurant, which is decorated with the artists’ work. Next, head over to Niyo Art Gallery to learn about how art is helping street children in Rwanda, and perhaps make a donation to support the education, medical care, and daily basic needs of less-fortunate Rwandans. Support sustainable fair-trade tourism by purchasing traditional crafts such as drums, baskets, wood carvings, and ceramics at Capalaki Handicrafts Cooperative, and see local Twa people perform traditional dances at The Dancing Pots. Be sure to take a look at the Parliament Building and Presidential Palace, which contain so much of the country’s history, including debris from the presidential plane that was shot down on April 6, 1994, the catalyst for Rwanda’s darkest chapter. The three cultures of Rwanda once clashed, largely over socio-economic differences, but today the Tutsi, Hutu, and Twa peoples represent a common commitment to the betterment of all Rwandan people. Through unity, collaboration, and absolute dedication, the people of Rwanda take every measure to ensure that the fabric of their country is never again torn by genocide and other crimes against humanity. Meeting some of the people from these three tribes allows you to see the value of each of their cultures and their pride in the homeland. Gorilla Safaris Uganda offers cultural tours that are sensitive to the preservation of Africa’s indigenous tribes, and all of our cultural activities are carefully coordinated with the local communities. Our goal is to provide our guests with authentic cultural engagements with Rwandan people while ensuring the privacy and respect that villagers need to maintain their cultural traditions. The activities allow villagers to share their culture, arts, beliefs, and much more, while providing a source of income that supports education, medical care, and other valuable resources. At Ibyiwacu Village, outside Volcanoes National Park, our guests are greeted by an amazing presentation featuring traditional drumming and dancing coupled with warm, heartfelt Rwandan hospitality. You visit a replica of the king’s house, learn about traditional medicine, meet children at the local school, and even sample some delicious food and banana beer. During your visit to Nyungwe National Park, take some time to explore Banda Village, in the heart of the park, and Kitabi Cultural Village, on the eastern edge of the park. With advance preparation, you can even stay overnight in the villages to see another side of day-to-day life here. Families traveling with older children always find the cultural activities in Rwanda to be educational and interesting for the loved ones. Imagine the delight on your children’s faces when someone from an exotic tribe shows them how to weave a basket, shoot a bow, or create a ceramic pot! Delving into the tumultuous history of Rwanda is difficult for many guests; yet, seeing the genocide memorial sites first-hand provides valuable insight into the transformative journey of the Rwandan people. Memorials from the 1994 genocide are scattered around the country and remain in the same state as when the tragedy was unfolding. The Kigali Genocide Memorial Center provides visitors with a two- to three-hour orientation into the events that occurred at the site, where an over 259,000 victims lie buried. We recommend this exhibit as your last stop after visiting other sites in the country. Each display is beautifully designed to tell the story of Rwanda in a poignant and moving way. The indoor museum provides a historical overview of the events that led up to the genocide, as well as displays dedicated to Rwandan children who were killed. Another exhibit highlights the global issue of genocide, with displays that depict the Holocaust and similar tragedies in Bosnia, Southwest Africa, Cambodia, and Armenia. In addition to the Tutsi, peoples from around the world were targeted around the same time the genocide took place. Camp Kigali Belgian Monument stands as a memorial to ten Belgian United Nations soldiers who were killed while protecting the prime minister. Their lives were taken to undermine international support that stood against the genocide. The Nyanza Genocide Memorial shows the next chapter in the genocide, after the Belgian soldiers were killed. The school was a hideout for 2,000 Tutsis, including 400 children, who were seized, taken to a nearby garbage dump, and murdered. Some of the most brutal killings occurred at two churches—Nyamata and Ntarama. These memorials are some of the most shocking and deeply emotional of all the memorials in Rwanda. The skulls and bones unveil the story of those who were murdered. Blood-stained walls, pews draped with clothing, sharpened stakes, bullet holes, and small wood caskets reveal a vivid and deeply emotional chapter in Rwandan history. The exhibits are so powerful that many guests find it difficult to reconcile the country’s past with the joy and warm-hearted hospitality that is Rwanda today—a contrast that is testament to the country’s dedication to defining and protecting a better future for all of its people. Believe it or not, Rwanda is home to one of Central Africa’s best beach escapes! Lake Kivu is the 18th deepest lake on the planet, with a total surface area of 2700 square kilometers at an elevation of 1460 meters. Imagine spending a few days exploring Rwanda’s lush green rainforests, communing with mountain gorillas, tracking chimpanzees, and walking in the footsteps of Rwandan kings, and then traveling a short distance to a sparkling lake and lovely beach for some rejuvenation. Lake Kivu offers endless possibilities for fun-filled beach days, including sailing, water sports, fishing, beachfront lounging, and much more! The splendid scenery does much to relax you. Explore the lake by way of a charter boat that will take you to one of the lakeside towns. Gisenyi is the most developed, with tranquil accommodations and post-colonial architecture nestled against sandy beaches dotted with swaying palm trees. Pine-covered hills invite guests to visit Kibuye, in the middle of the lakeshore, and Cyangugu, in the south. In addition to the charming settlements along the lake, you can take nature walks to explore the flora and fauna, including an amazing bird population. While other lakes in Africa are home to hippos and crocodiles, Lake Kivu is free of these dangerous animals and safe for swimming. Kayaking, canoeing, jet-skiing, waterskiing, and windsurfing can also be arranged. Anglers can try their luck with native fish species, either from shore or by boat. Go hiking or cycling in the hills around the lake and visit a local flower plantation at the former home of Rosamond Carr, one of Dian Fossey’s closest friends. If you prefer coffee over flowers, AfricanMecca can arrange a tour of the coffee plantation at Cyimbili, or perhaps a bat-viewing expedition on Napoleon Island, one of the distinct islands found on Lake Kivu. Book a gorilla trekking permit for inside Volcanoes National Park, one of Africa’s oldest national parks, and you’ll be led on a daily guided gorilla trek that tops out at eight visitors. The only other two countries that offer the same experience—the Democratic Republic of the Congo and Uganda—are less safe, and require more vigorous hikes with no guarantee of great ape encounters. The country debuted signature Rwandan cuisine with the help of award-winning American chef Silvia Bianco earlier this year for the World Economic Forum on Africa, and has been perfecting it ever since. The dishes, available in restaurants and luxury hotels like the Kigali Serena Hotel, blend traditional Rwandan foodstuffs, such as sambaza (small fish) and urwagwa (a fermented banana beer) with modern culinary methods and artistic presentation. Don’t leave the country without trying Rwandan coffee (more on that later). After acquiring lions a few years back, and with plans to introduce black rhinos this year, Akagera National Park is primed to become a Big Five safari destination. With elephants, buffalo, and a wide variety of antelope, you’ll get the full savannah experience and the added bonus of the park’s river boat cruises, which include rare encounters with crocodiles and hippos. Akagera provides campgrounds and tents for a small fee, but honestly, “glamping” on the edge of Lake Ihema at the Ruzizi Tented Lodge is the way to go. Even better? All proceeds benefit the park. Mountain gorillas are the best-known of Rwanda’s primates, but the country offers many other scampering creatures to delight visitors, including chimpanzees, golden monkeys, blue monkeys, and black and white colobus. Chimpanzees are considered the most human-like of primates, and Nyungwe National Park is the premium destination in Rwanda for chimpanzee viewing experiences. Just before daylight, you start a journey into the forests where families of chimps live in a natural habitat. The effort to find them makes for a wondrous combination of adventure and mystery as you follow the keen leadership of a professional guide, learning the nuances of tracking and locating these fast-moving animals. Each day the groups of chimps move through the forest in search of food before finding a secluded place to build their nests and rest for the night. Fortunately, our guides are experts in locating the chimpanzees, so your chances of seeing them are very good. Another primate species that thrills our guests is the golden monkey, a colorful species that constantly scampers through the treetops, stopping only to dine upon fruits and leaves. The golden monkeys of Rwanda can be found in the incredible bamboo forests of Volcanoes Park, as well as Gishwati-Mukura Forest in the northwestern part of the country. Unconfirmed sightings have also been reported in Nyungwe Forest. Another of the 14 primate species in Rwanda, many of which are endemic and endangered, are the black and white colobus monkeys that live in groups of over 300, the largest of their kind on the continent. Hikes through the deep African rainforest to find the colobus can be challenging for some guests. During your primate treks, you may also come across blue monkeys, grey-cheeked mangabeys, vervet monkeys, Dent’s monkeys, L’Hoest’s monkeys, and red-tailed monkeys. You’ll need a passport valid for six months from the date of entry is required by all foreign nationals to enter Rwanda. Passports must also have a one blank page for stamps. Visas for Rwanda are required by all foreign nationals. Nationals of Australia, Germany, Sweden, the UK and the USA can purchase a visa on arrival. All other nationals must obtain a visa in advance. Travellers require a yellow fever vaccination certificate if they are coming from yellow fever endemic countries or countries with active yellow fever transmission outbreaks. Check this is still the case before travelling as this is subject to change. September – Baby gorillas are named during the Kwita Izina ceremony; ideal for hiking.